Cory Aquino had no political ambitions of her own until her husband Senator Benigno Aquino was assassinated in 1983. Almost instantly, she became a unifying force against the autocratic President Ferdinand Marcos and ran in the 1986 presidential election. The ruling powers declared Marcos the winner, but a series of peaceful demonstrations along with backing from the church finally put Aquino in power. 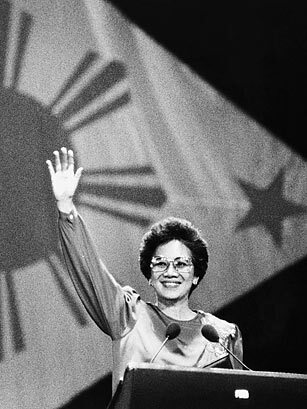 Her sudden ascension as the first female President of the Philippines was the battered islands' first step toward democracy. Weathering both coup attempts and corruption charges, Aquino was unable to push through much of the social reform that her supporters had hoped for. But when she stepped down in 1992, she still stood tall as the people's choice. See TIME's Corazon Aquino covers.